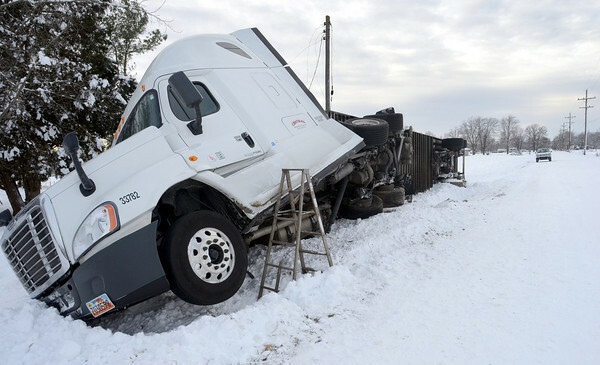 Over hard: At approximately 2:00 PM on Tuesday 01/07/2014 Vigo County Sheriff's Deputies along with Seelyville Fire Dept were dispatched to 10901 E SR 42 for an overturned semi. The semi owned by Central Refrigerated Services Inc out of Salt Lake City UT was eastbound on SR 42 carrying a load of produce. The driver, Frederic A Hernandez, 21, of Bakersfield CA, stated he was on SR 42 because of the closure on I-70. Hernandez advised that the rear tires of his trailer got off of the hard packed snow and pulled the truck and trailer into the ditch causing the trailer to overturn and the truck to begin to overturn. The trailer hit a power utility pole knocking out power to one residence and the truck and trailer both missed hitting a natural gas meter by approximately 2 feet. Hernandez was transported to a local hospital by Trans-Care ambulance for complaint of back pain.